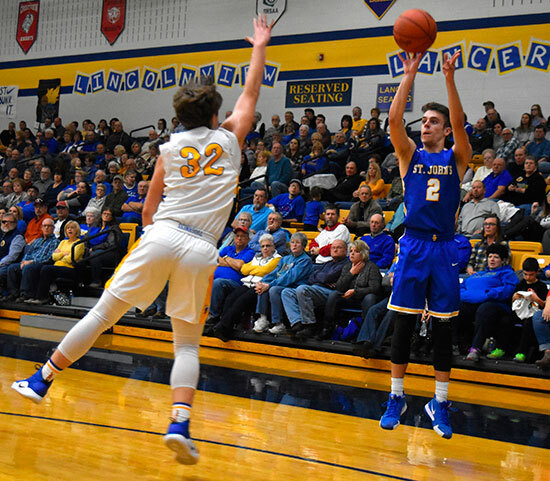 MIDDLE POINT — St. John’s handed Lincolnview their third loss in a row, as the Lancers couldn’t get their defense going in the second half. The Lancers were only able to muster eight points in the second half until Jorge Salinas scored six himself in the final 30 seconds. It wasn’t too little too late as the Blue Jays won 47-41. Depending on who you ask, it was one of two things in the second half that led to the Blue Jays victory. Astute defense or a slumping Lancers offensive attack. Though Lincolnview head coach, Brett Hammons, thought it came down to the Lancers not hitting their shots. 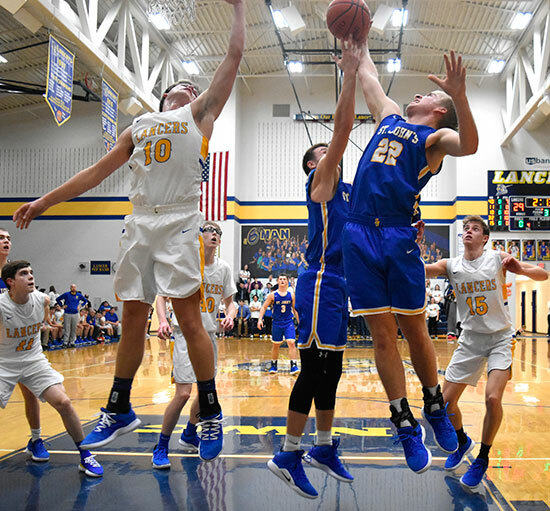 Lincolnview jumped at early in the game thanks to play by Ethan Kemler and Creed Jessee, but the Blue Jays were able to stay in the contest thanks to their own Lucas Metcalf and Jared Wurst. The Lancers held a slight lead at half time, 27-25. Jessee scored 12 points on the night, 10 of which came in the first half. The second half started out with Metcalf hitting a 3-pointer to give the Blue Jays their first lead of the ball game. There was a pair of possessions where the game went back and forth, then both offenses went quiet. Metcalf scored again with seconds remaining the third to extend their lead to 35-31. In tthe fourth, it seemed as though either team could take reigns. Though the Blue Jays led the entirity of the quarter it always felt like the Lancers were in striking distance— because they were. Jake Bowersock opened scoring int he fourth with a bucket for the Lancers, but Metcalf responded with a 3-pointer, 38-33. There would be just one more field goal in the quarter, with Jessee’s bucket coming a few possessions after, until the final minute. Both teams struggled to find that basket. Lincolnview trying to tie the game up, while St. John’s was looking to put the game away. Jared Wurst helped the latter happen. Wurst drive right down the middle of the lane to put that game at 40-35. After Lincolnview was unable tp rebuttle, they were forced to put the Blue Jays at the foul line, which sealed the fate of the game. Wurst and Metcalf put an exclamation point to a fantastic weekend, as the two seniors led the Blue Jays to back-to-back wins. Last night St. John’s beat New Bremen in triple overtime. Metcalf and Wurst scored 85 of the Blue Jays 101 points this weekend. They scored 44 Friday and 41 Saturday. St. John’s improves to 12-6 on the season and are rolling at the right time as February is the right month to hit a hot streak. 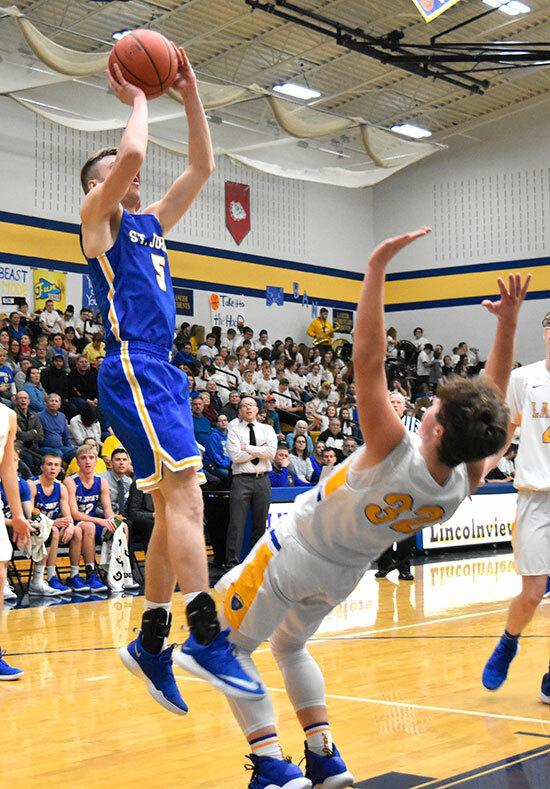 Lincolnview has hit a bump in the road, as the Lancers have dropped three in a row, now. Lincolnview drops to 9-8 on the season. They’ll be back in action next friday against Ada.